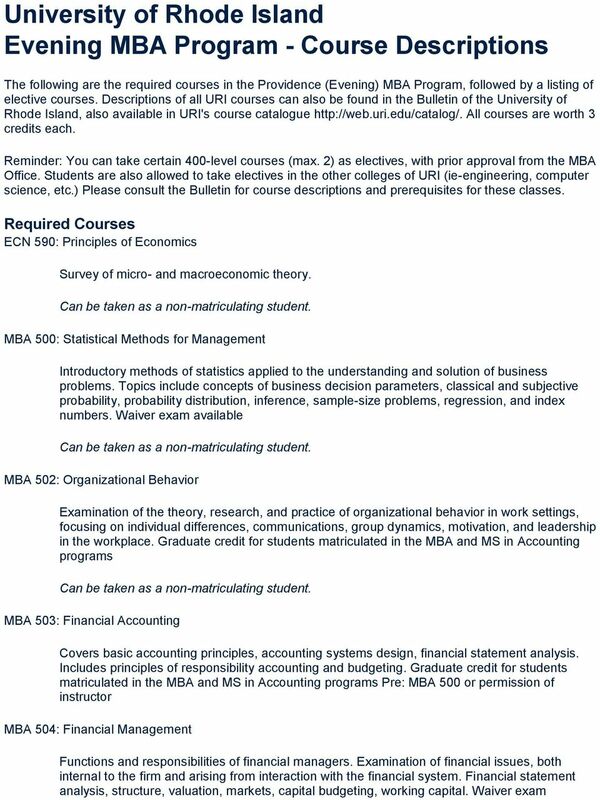 Download "University of Rhode Island Evening MBA Program - Course Descriptions"
6 Overview of mutual funds business. Portfolio management, risk management techniques, shareholder servicing, Federal and state regulatory oversight, marketing and distribution, custody, technology and societal issues. Pre: BUS 320, BUS 321 or permission of instructor BUS 429: Global Investment Management Detailed analysis of the problems encountered in the process of investing funds in international capital markets. Particular attention is devoted to multi-currency dimensions, foreign information sources, and foreign regulations. Pre: BUS 320, BUS 321 MBA 566: Security and Investment Analysis Analysis of the problems of investing funds and managing investments. Use of the latest investment theories and their implementation via quantitative techniques will be explored. Pre: MBA 504 or equivalent. MBA 567: Advanced Portfolio Theory and Security An examination of advanced theories and practices in portfolio building and maintenance. Issues related to security price behavior are also examined. Pre: MBA 504 or equivalent. MBA 568: Advanced Financial Theory Analysis of the theoretical framework for corporate decision making related to financial planning, capital budgeting decisions, dividend policy, and capital structure decisions. Emphasis on current research developments. 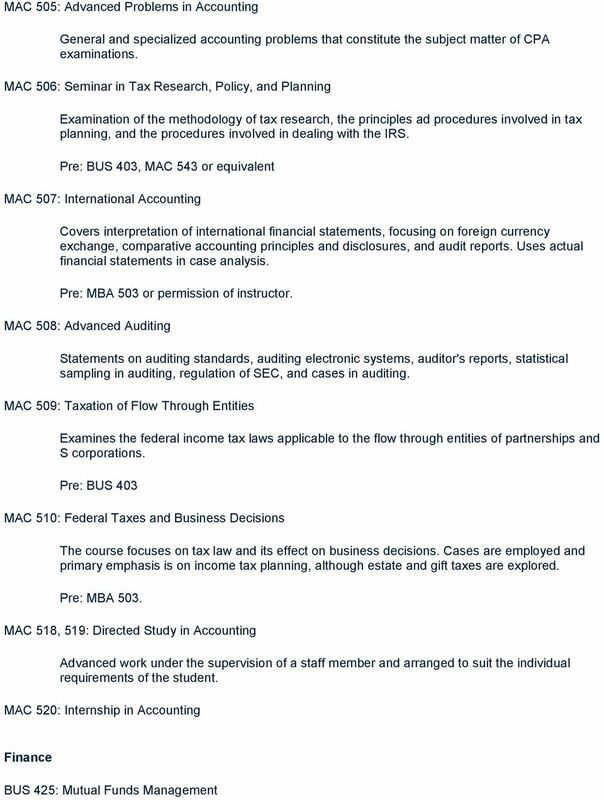 Pre: MBA 504 or equivalent. 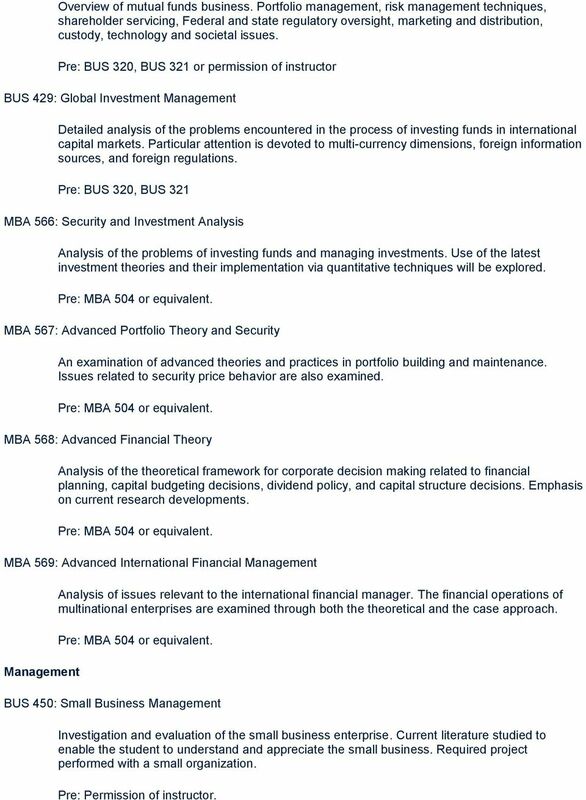 MBA 569: Advanced International Financial Management Management Analysis of issues relevant to the international financial manager. The financial operations of multinational enterprises are examined through both the theoretical and the case approach. 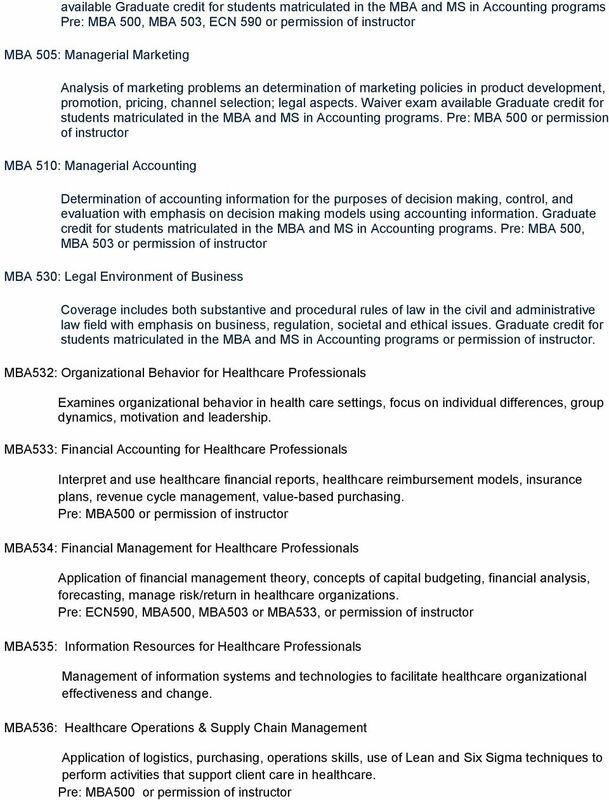 Pre: MBA 504 or equivalent. BUS 450: Small Business Management Investigation and evaluation of the small business enterprise. Current literature studied to enable the student to understand and appreciate the small business. Required project performed with a small organization. Pre: Permission of instructor. 7 BUS 449: Entrepreneurship Procedures for starting and operating one's own business including the following topics: the business idea, personality traits, feasibility analysis, business plan, and functional area basics. Intended for non-business majors. Pre: Senior or graduate standing and permission of chairperson. Not open to student with credit in REN 325. 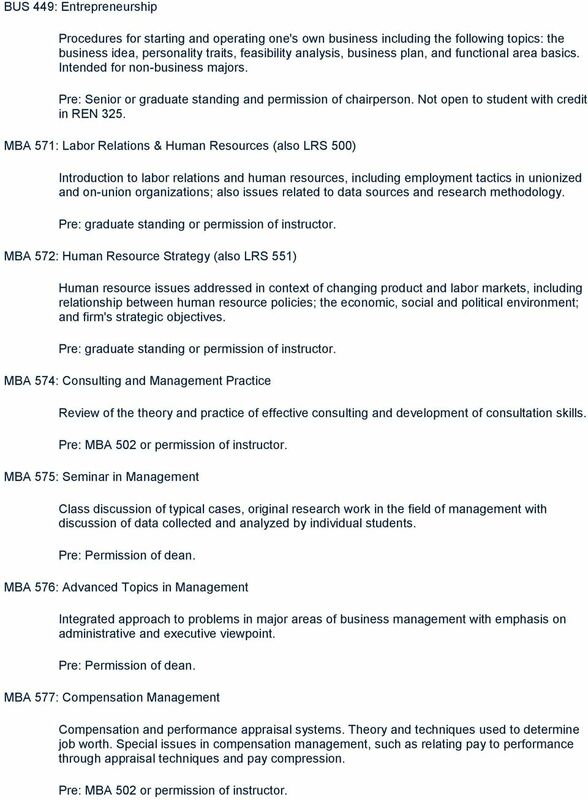 MBA 571: Labor Relations & Human Resources (also LRS 500) Introduction to labor relations and human resources, including employment tactics in unionized and on-union organizations; also issues related to data sources and research methodology. Pre: graduate standing or permission of instructor. MBA 572: Human Resource Strategy (also LRS 551) Human resource issues addressed in context of changing product and labor markets, including relationship between human resource policies; the economic, social and political environment; and firm's strategic objectives. Pre: graduate standing or permission of instructor. MBA 574: Consulting and Management Practice Review of the theory and practice of effective consulting and development of consultation skills. 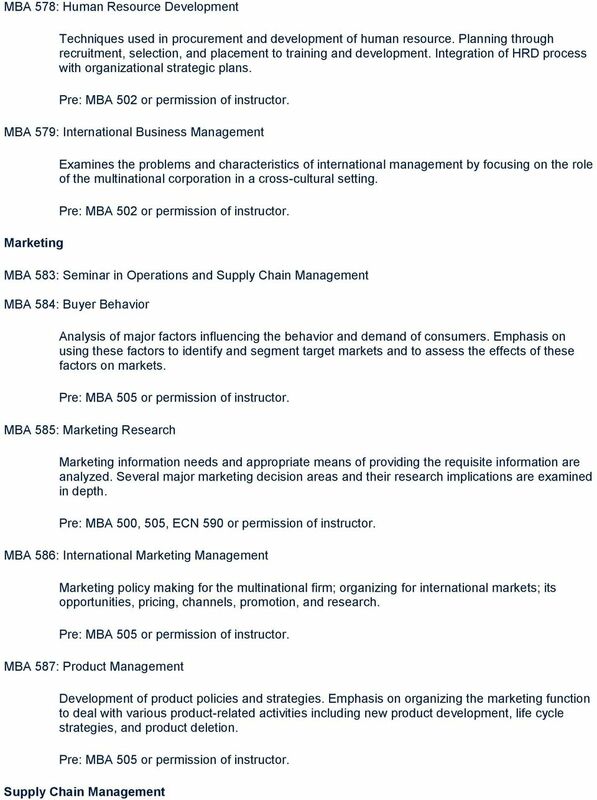 Pre: MBA 502 or permission of instructor. MBA 575: Seminar in Management Class discussion of typical cases, original research work in the field of management with discussion of data collected and analyzed by individual students. Pre: Permission of dean. MBA 576: Advanced Topics in Management Integrated approach to problems in major areas of business management with emphasis on administrative and executive viewpoint. Pre: Permission of dean. MBA 577: Compensation Management Compensation and performance appraisal systems. Theory and techniques used to determine job worth. Special issues in compensation management, such as relating pay to performance through appraisal techniques and pay compression. Pre: MBA 502 or permission of instructor. 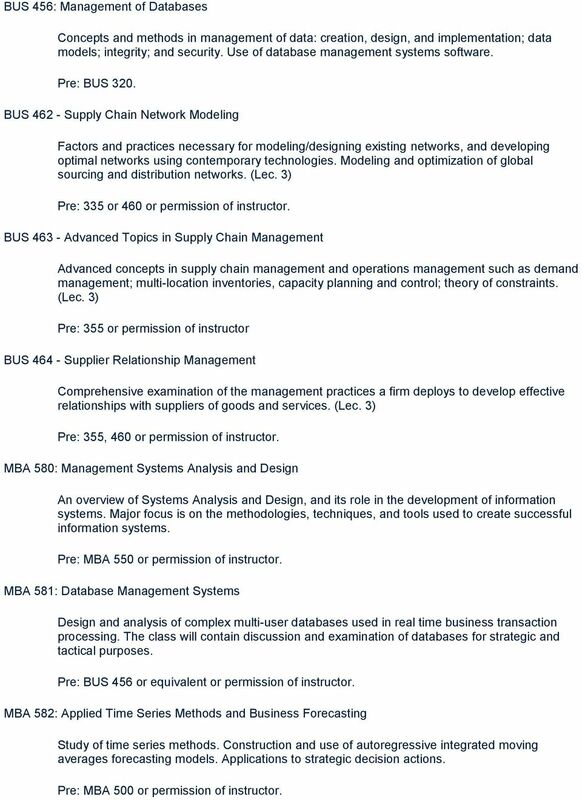 9 BUS 456: Management of Databases Concepts and methods in management of data: creation, design, and implementation; data models; integrity; and security. Use of database management systems software. Pre: BUS 320. BUS Supply Chain Network Modeling Factors and practices necessary for modeling/designing existing networks, and developing optimal networks using contemporary technologies. Modeling and optimization of global sourcing and distribution networks. (Lec. 3) Pre: 335 or 460 or permission of instructor. BUS Advanced Topics in Supply Chain Management Advanced concepts in supply chain management and operations management such as demand management; multi-location inventories, capacity planning and control; theory of constraints. (Lec. 3) Pre: 355 or permission of instructor BUS Supplier Relationship Management Comprehensive examination of the management practices a firm deploys to develop effective relationships with suppliers of goods and services. (Lec. 3) Pre: 355, 460 or permission of instructor. MBA 580: Management Systems Analysis and Design An overview of Systems Analysis and Design, and its role in the development of information systems. Major focus is on the methodologies, techniques, and tools used to create successful information systems. Pre: MBA 550 or permission of instructor. MBA 581: Database Management Systems Design and analysis of complex multi-user databases used in real time business transaction processing. The class will contain discussion and examination of databases for strategic and tactical purposes. Pre: BUS 456 or equivalent or permission of instructor. MBA 582: Applied Time Series Methods and Business Forecasting Study of time series methods. Construction and use of autoregressive integrated moving averages forecasting models. Applications to strategic decision actions. Pre: MBA 500 or permission of instructor. 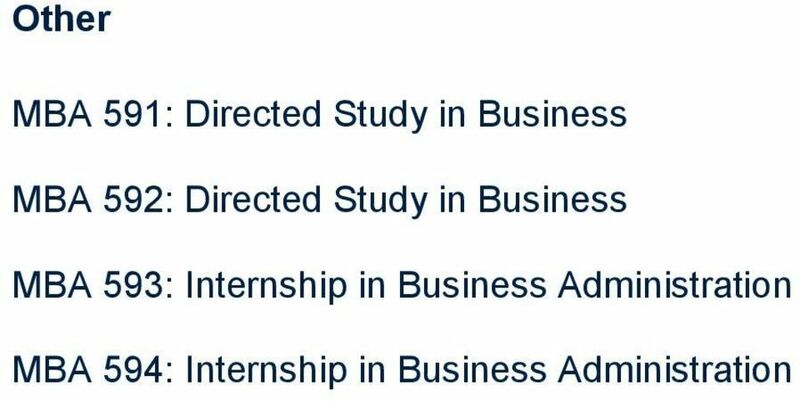 Course Descriptions Business Administration & Finance BUSA 1900 (D) Introductory Special Topics. 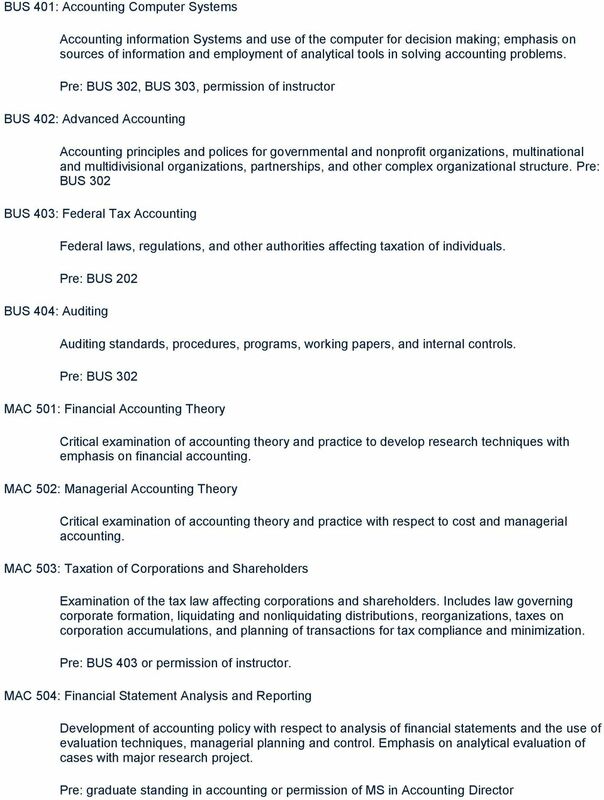 General topics elective for the nonmajor as well as the major... credit to be arranged BUSA 2000 (F/S) ENACTUS. Business. Douglas C. Haines, Dept. Chair of Business (301F J. A. Albertson Bldg. 83844-3161; phone 208/885-7146; dhaines@uidaho.edu). Seattle Pacific University 2005 2006 Graduate Catalog 39 SCHOOL OF BUSINESS AND ECONOMICS DAVID L. MCKENNA HALL 206.281.2753 DJWYSOM@SPU.EDU WWW.SPU.EDU/DEPTS/SBE Business Administration (M.B.A.) The M.B.A.
Human Resource Management: Business Administration 205, 207, 333, 335; Communication 228, 260; Psychology 210. 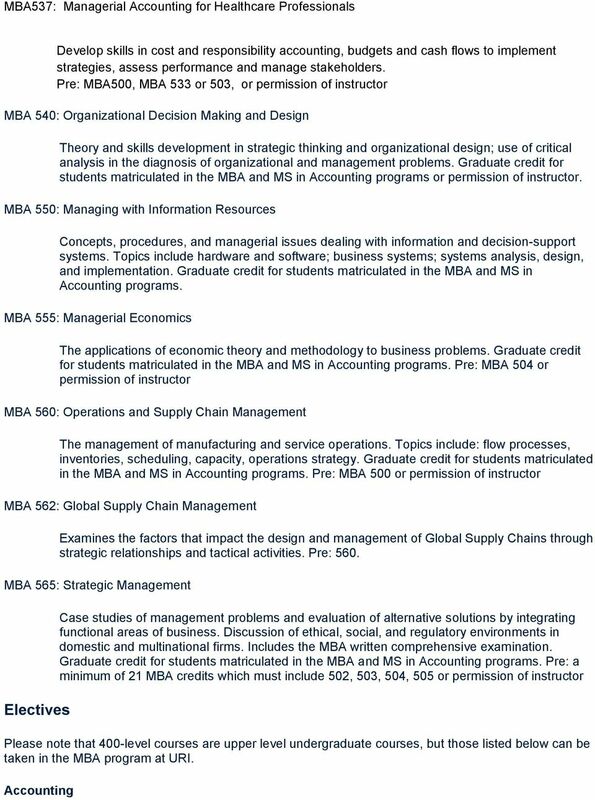 Four business-critical themes are central to Curry College s Master In Business Administration (MBA). The unique framework for the model of business excellence integrates: I. Leadership and Ethics II. EXECUTIVE MBA Course Descriptions Business & Economic Context, XMBA 4102 This introductory economics course is designed to provide a survey of essential economics concepts and frameworks for executives.